At 7:00 AM I leave the house of Hansu and Afworki, after a small breakfast of tea and Kitcha. On the Giro Fiori town circle numerous yellow Toyota mini buses offer their services for two Nakfa only. "Dearit, Dearit, Dearit!" It is only a three kilometers walk, but due to the circumstances, I will allow myself some rest today. I have done this walk so often. I join the praying people in the back of the makeshift church extensions. When the monks in the back start their prayers, I am on the front row. I watch and listen the monotonous singing of the monks, beating their enormous drums. 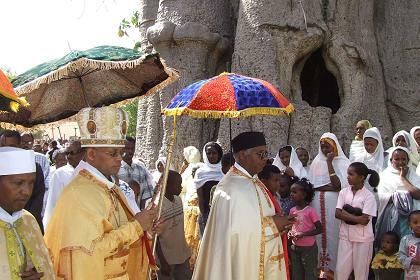 At 9:00 AM the procession of various religious groups and church leaders around the baobab tree starts. 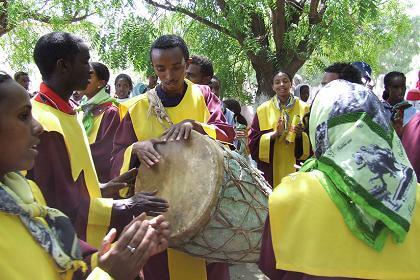 It is a joyful event of religious people in colorful clothes, singing and playing drums and tambourines. It is no problem to move to the front, as long as I do not cross the virtual line separating the public from the procession. Overenthusiastic children are strictly redirected to their proper places by the police. After the procession, I walk up and down the festival area, looking for familiar faces. I brought copies of last years pictures, but how will I find the people in this crowd? Looking at the faces of the people, I find some of them them. 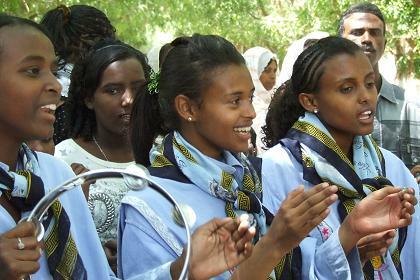 A very short smile is enough to recognize a group of Bilen women. When I show them the pictures, they react surprised and happy "This is my sister Abrehet!". They ask if they can have the pictures, and the group sitting next to them want me to picture them as well. I have to bring them copies the pictures of course. I join their picnic, drinking coffee and eating some food that fits into my diet. We make more pictures. 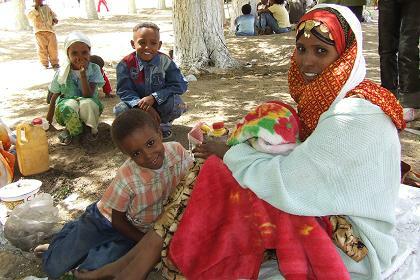 I am the guest of an Asmara family. Their uncle came to visit them from Italy. Of course they made the trip to Keren to witness this happy event. Again we drink coffee. One of the professional photographers walking on the festival makes pictures, as a souvenir. Another group of people calls me "Sit and drink coffee with us!". I have a feel of recognition, but I don't know from where. I ask them from where they know me. "Last year you visited our street in Mai Temenai, when we were preparing suwa for the wedding". 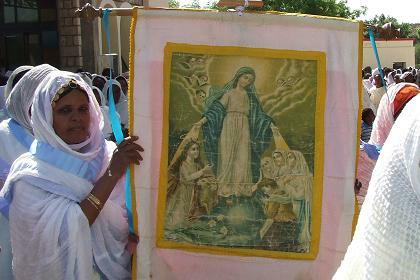 Unfortunately, I left the copies of these pictures in Asmara, not expecting I would meet them here. When I am on my way to leave the festival grounds, a group of women invites me to sit with them. For the fourth time I participate in a coffee ceremony and eat some kitcha. The women offer me araki. And another, and another. "Will you marry me?" is the unexpected question of one of the women. Oops! Good girls go to heaven, bad girls go everywhere. I decide to be just as direct to the girl that is half my age. I try to explain to her that there is a major difference between wealth and happiness. 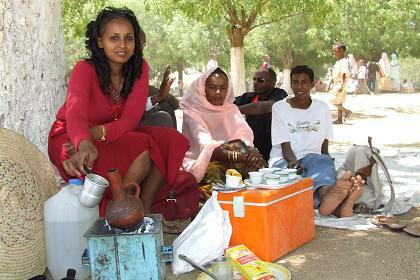 She should find herself a young strong Eritrean man, and not sell herself so easy to a random tourist. No intelligent and trustworthy man will respond positive to such a direct proposal, and if he does so, she should be sure that there is something very wrong with him. 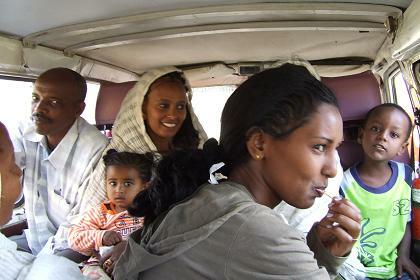 Cozy interior of the mini bus - Keren Eritrea. 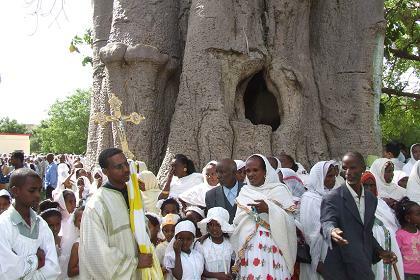 Women gathered around the baobab tree - Keren Eritrea. 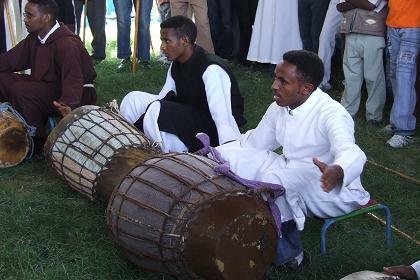 Priests beating their drums - Festival of Mariam Dearit - Keren Eritrea. 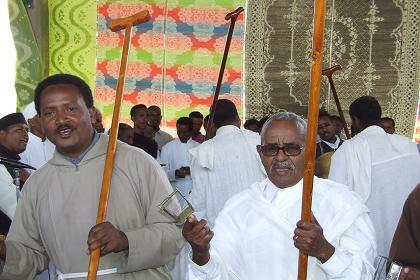 Priests singing religious songs - Festival of Mariam Dearit - Keren Eritrea. 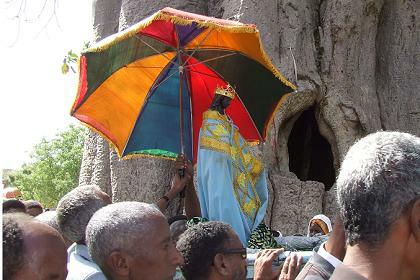 Procession around the tree - Festival of Mariam Dearit - Keren Eritrea. 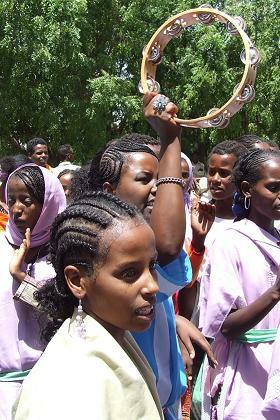 Singing religious songs - Festival of Mariam Dearit - Keren Eritrea. 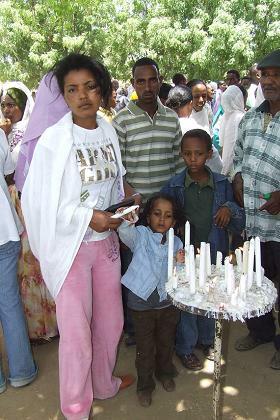 Bisrat burning a candle - Festival of Mariam Dearit - Keren Eritrea. 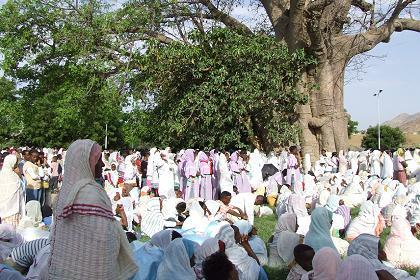 Picnic with a Bilen family - Festival of Mariam Dearit - Keren Eritrea. 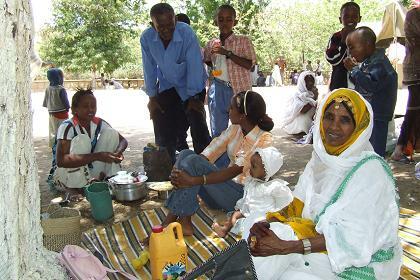 Coffee ceremony with an Asmara family and their Italian uncle. 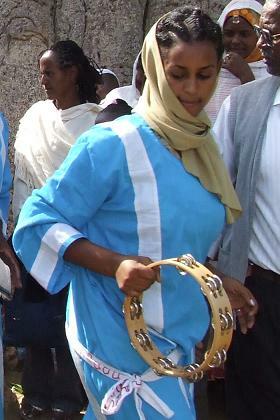 Festival of Mariam Dearit - Keren Eritrea.